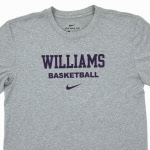 Nike® men's Dri-Fit T-shirt with WILLIAMS BASKETBALL on the front. Dark heather. Nike® men's Dri-Fit T-shirt with WILLIAMS CREW on the front. Dark heather. 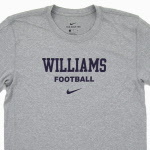 Nike® men's Dri-Fit T-shirt with WILLIAMS FOOTBALL on the front. Dark heather. 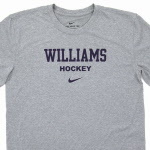 Nike® men's Dri-Fit T-shirt with WILLIAMS HOCKEY on the front. Dark heather. 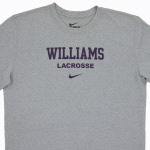 Nike® men's Dri-Fit T-shirt with WILLIAMS LACROSSE on the front. Dark heather. 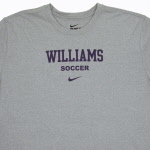 Nike® men's Dri-Fit T-shirt with WILLIAMS SOCCER on the front. Dark heather. Men's T-shirt from JanSport with WILLIAMS, realistic soccer ball & SOCCER design on the front. Oxford. Was $17.99. T-shirt with Williams and your favorite sport, ALL SPORTS AVAILABLE. Oxford. 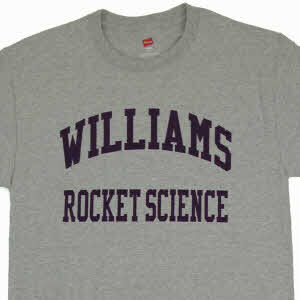 T-shirt with WILLIAMS ROCKET SCIENCE on the front. Oxford. T-shirt with WILLIAMS FOOSBALL on the front. Oxford. Was $16.99.